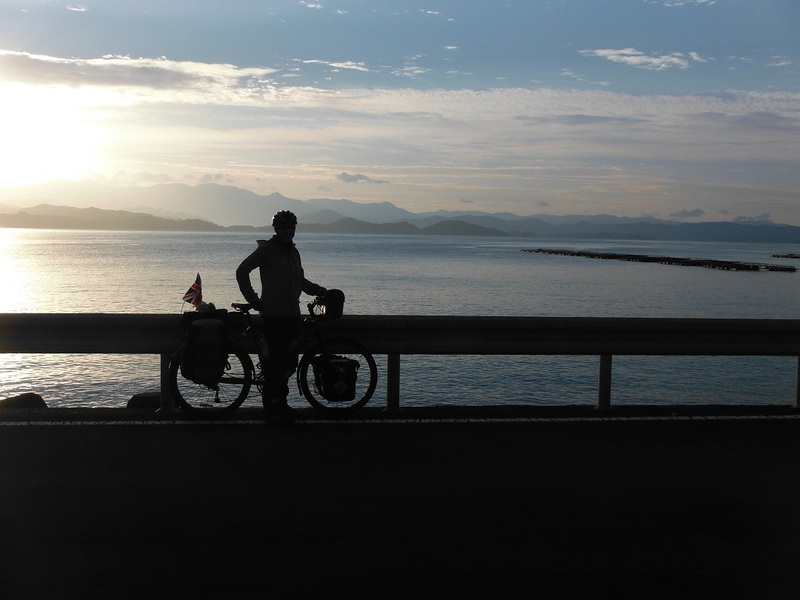 We arrived in Japan not knowing what to expect, other than that it would be very different from cycling across the USA. It ended up being a country that entertained us in many ways. 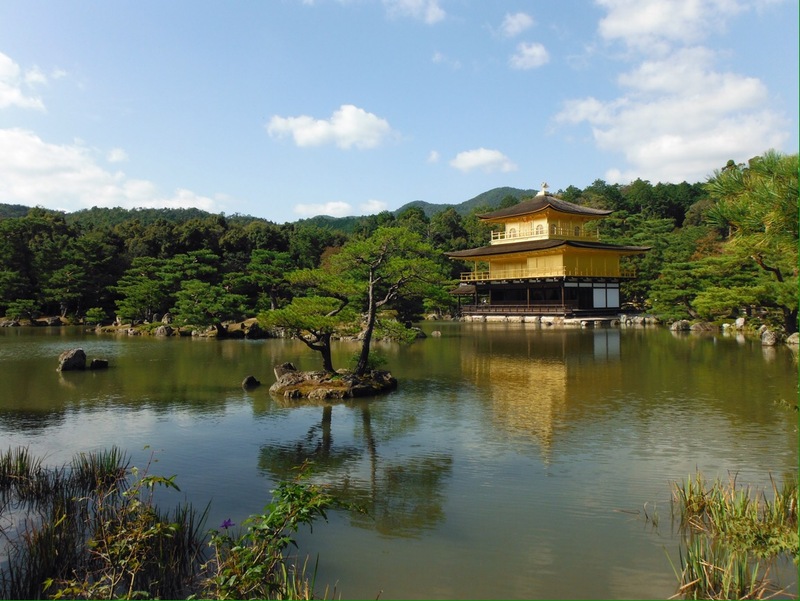 Japan is a great place to cycle tour for a number of reasons – good food and water is everywhere, camping is easy and hot springs (onsens) are a great way to end a day’s cycling. But one of the best things is that so many small, quirky things made us smile over and over again. Here is just a selection! We mentioned banana surprises earlier, but this was not the only food surprise. A lot of food was a surprise for us as we had no idea what we were buying a lot of the time, but particular foods even when you thought you knew them could still surprise you. Take the humble hat cake. (No? It’s a Kochi speciality. A cake shaped like a hat). The first one we tried was plain. It was great. Then we bit into our next one to find a sweet bean paste filling. Surprise! Another one of our favourite snacks was a fried potato fritter type thing that had different flavoured fillings. But they all looked the same on the outside so we never knew what our filling might be. Meat, vegetables, curry… surprise! The perfect cyclist snack, onigiri (a rice triangle wrapped in seaweed), has flavoured fillings according to the colour of the label. But we never seemed to get the same one twice. It was always a surprise. 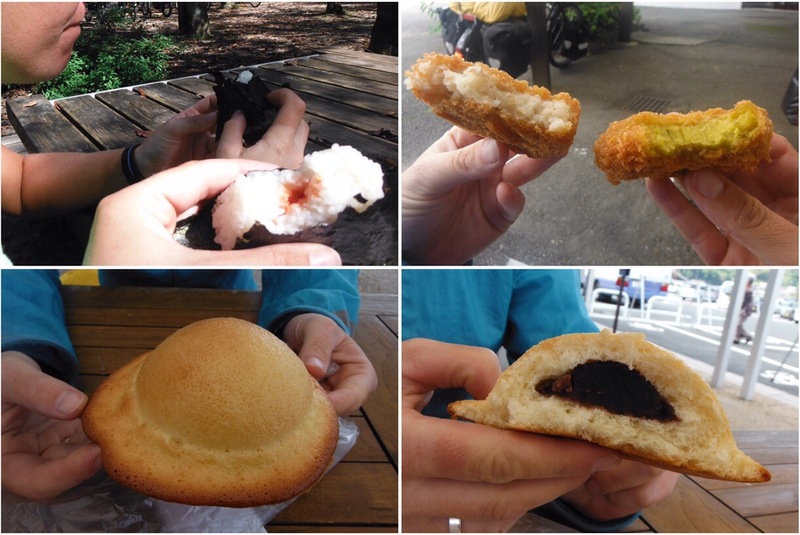 Onigiri surprise; friend potato surprise; and hat cake surprise. It seemed to us that the vast majority of Japanese men nearing retirement are employed in the construction industry. Mostly in the important task of supervision. Every construction site, however big or small, would have a team of construction supervisors at the entrance making sure there was no confusion over who had right of way and directing traffic and pedestrians with large glow sticks/lights sabres or flags. This role was taken seriously. And for cyclists it is amazing – as soon as they see you coming, you see the oversized glow stick wave and the traffic is held up until you are safely through. Awesome. Not yet moved up the ladder to get a glow stick, the humble flag waverer keeps traffic moving. We found some instances where there must somehow be a shortage of men nearing retirement so a model construction worker had to be used instead. The level of attention to detail was impressive. We also found model policemen, a model car park attendant and many very realistic scarecrows. Construction worker; parking attendant; policeman. Some more life-like than others. I still wasn’t sure whether the dude on the left was real or fake until I got within a few meters. 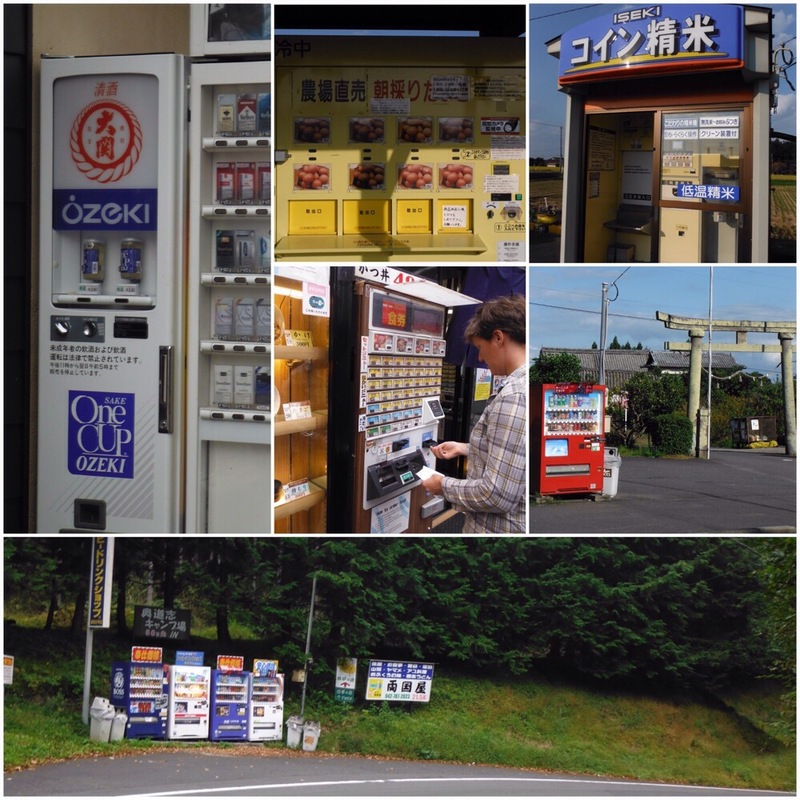 Probably the thing you see most often in Japan, more than convenience stores and shrine gates, is a vending machine. They are everywhere. If you were in a car you would never have to drive for more than five minutes without seeing one, which means on a bike they are pretty regular too. More impressive than their contents were how they were installed, run and refilled in some of the most out of the way places, like the edge of a field. Mostly they have cold drinks, but if you are lucky there will be not one vending machine but a row, with different delights in each. We saw beer, cigarettes, sake (wine), ice cream, noodles. But we were expecting more diversity, and on our penultimate day in Japan vending machines got a whole load more interesting when we saw a lay-by with an egg vending machine and a rice one. The thing you see the most of in Japan. A vending machine (or 4) on every corner. There you are, riding along a quiet road, and from nowhere a tannoy system fires up and starts playing random music. This was nice. Less nice was when riding past crop fields and some kind of animal noise starts playing, presumably to scare away birds (and cyclists). Most entertaining was probably when we were in our tent almost asleep and Auld Lang Syne started playing over the campsite tannoy, and was repeated lullaby-style for fifteen minutes to demonstrate that fun time was over. 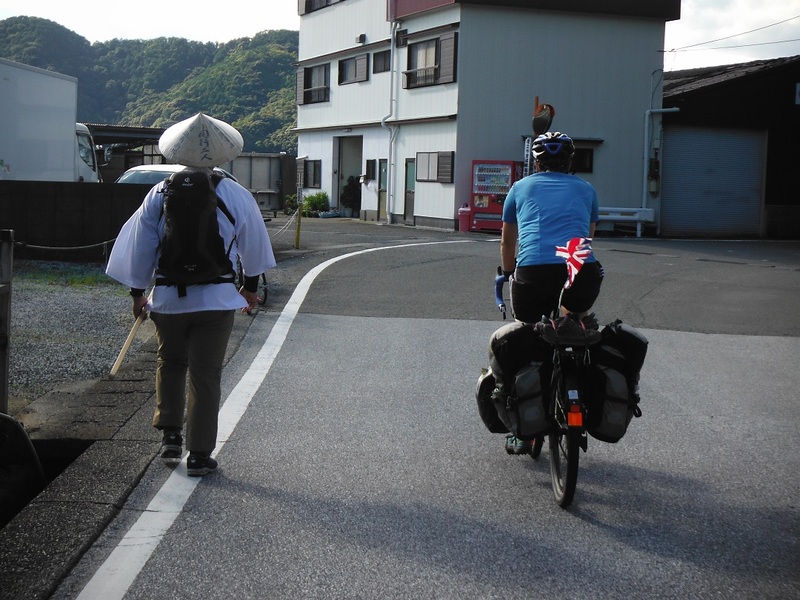 I’m actually not sure this made us smile at the time, but the extensive tannoy system is a funny part of life in Japan. As well as the hundreds of jobs available in construction for those skilled with a giant glow stick, there are many other jobs that some people (us) might consider a little pointless. 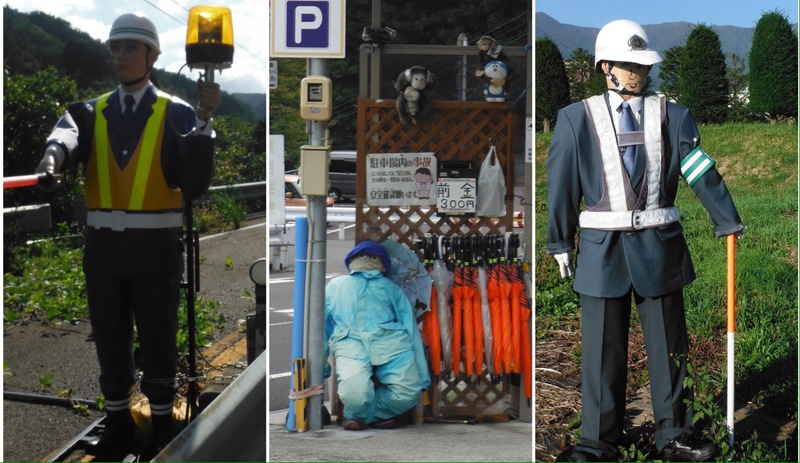 There is obviously leaf-blowing, the most pointless job ever that can be seen across the world, but we had some Japan-specific favourites: someone holding a sign warning that construction is ahead (just put a sign up? 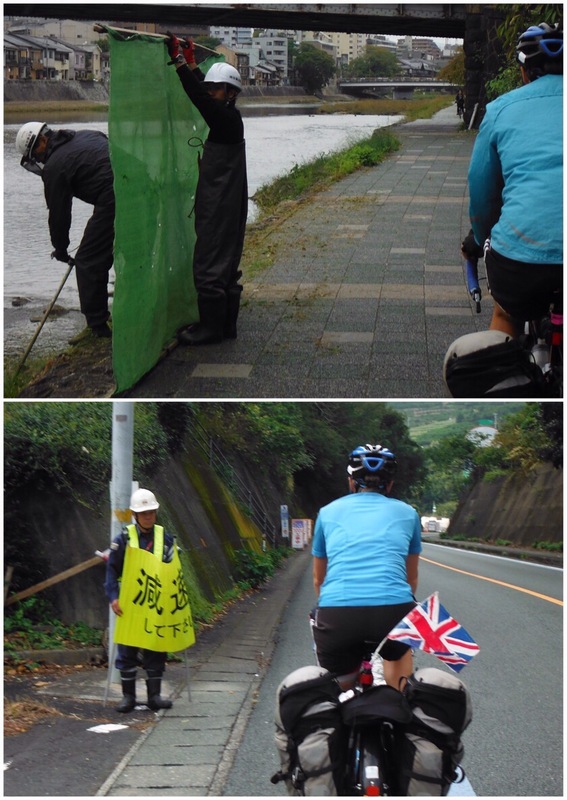 ); steam cleaning the white line on the side of the road (its Japan, it’s not that dirty anyway); and a strimmer’s mate, someone holding a screen next to a verge strimmer to stop the grass spreading on the pavement (resoundingly unsuccessfully). We felt sorry for the guys holding up signs warning of roadworks ahead. He didn’t even get a flag, never mind a glowstick. A sign on it’s own would probably do the same job. 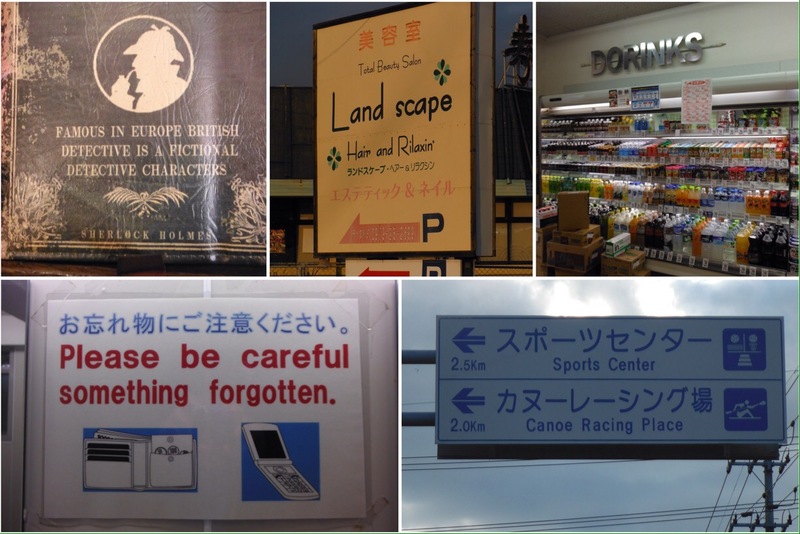 Like the loser I am, I find signs in different countries fascinating. 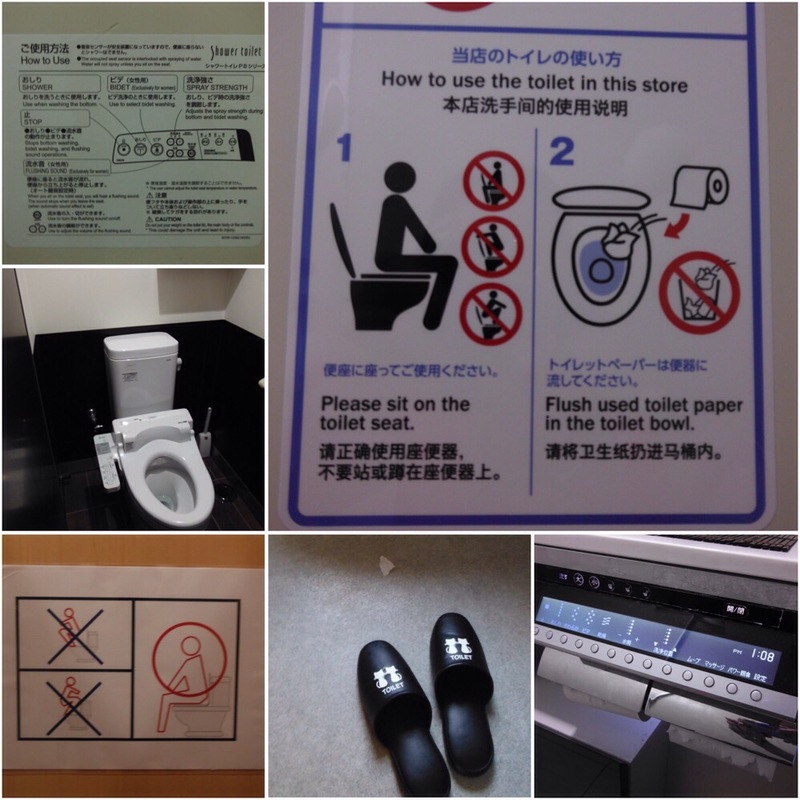 It shows how there are innumerable ways of conveying the same type of instructions/warnings. In Japan it is mostly kid cartoon style, even sometimes kids drawings. We wondered if towns had competitions in primary schools to design some signs, particularly those telling you not to drop litter. Quite serious warnings (e.g. be careful not to die from this or that) were portrayed with cartoon animals. Others just made us laugh. 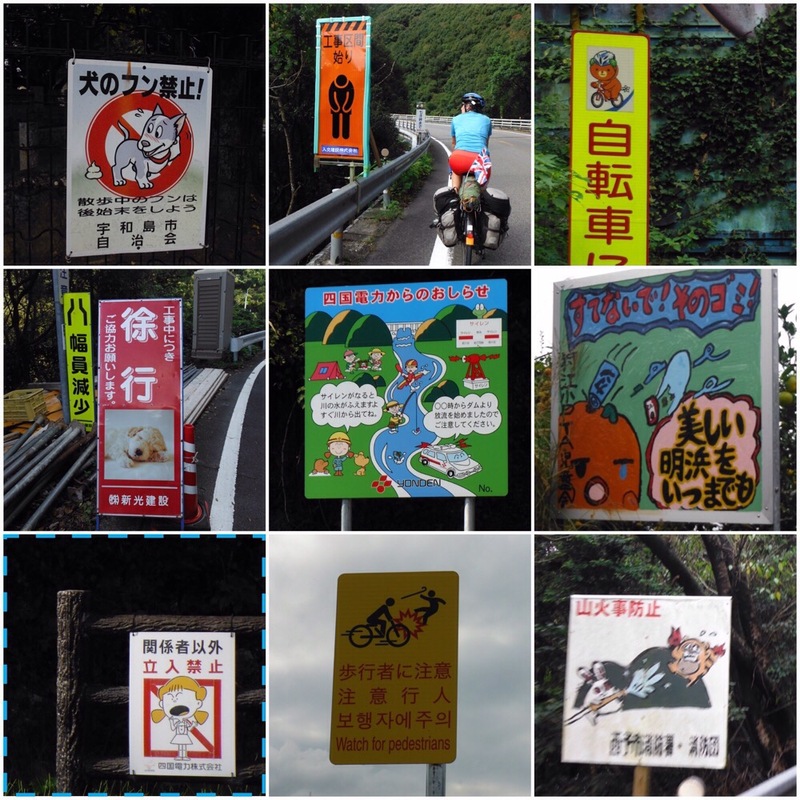 Beware of cartoon dog poo; sad workmen; bears on bikes; sleeping dogs; and many other road hazards. I don’t think we’ve cycled in a country where less English was spoken, so it was strange to see English translations in many places (particularly supermarket departments). But there’s a bit of work to be done on the quality of the English. Another great feature of Japan for cyclists is that there are public toilets everywhere, and they are the cleanest toilets I have ever seen. But they are more than just toilets. They are shower toilets, with full washing facilities. Also you can use the music button to play a flushing sound, covering any embarrassing noises (sometimes this noise is automatic). Even better, toilets in hostels/hotels have toilet slippers, so you change your regular slippers at the door for plastic toilet slippers. Brilliant. The toilet instructions also never failed to make us smile. Toilets here in New Zealand are so dull in comparison. 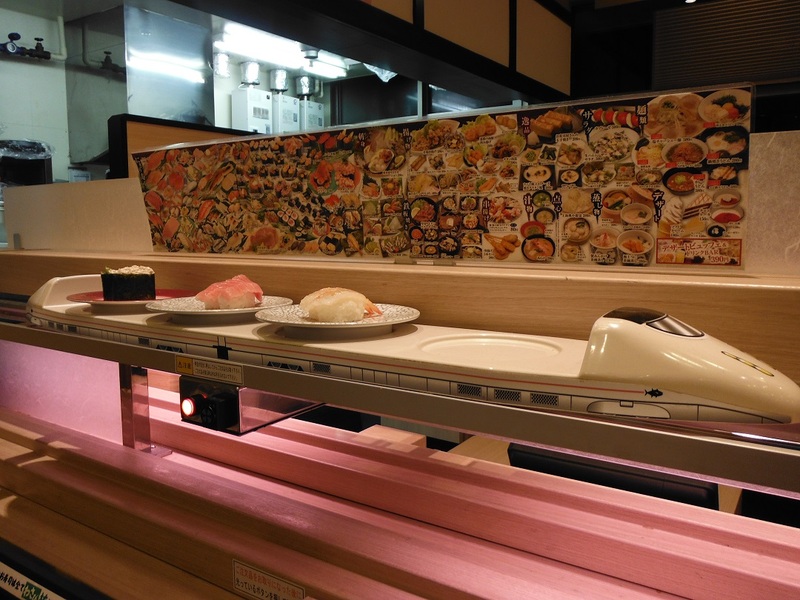 On our last night in Japan our sushi arrived on a Shinkansen (bullet train). Smiles all round. Thanks to Japan for making us smile. 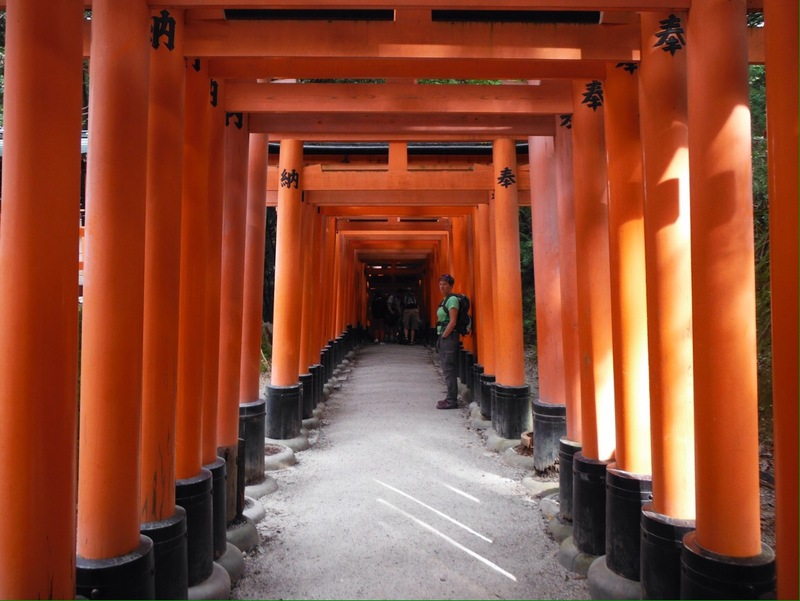 Kyoto is the former capital of Japan and is famous for an abundance of intact original shrines and temples (many elsewhere were bombed in WWII/destroyed in fires/earthquakes and so are modern reconstructions). 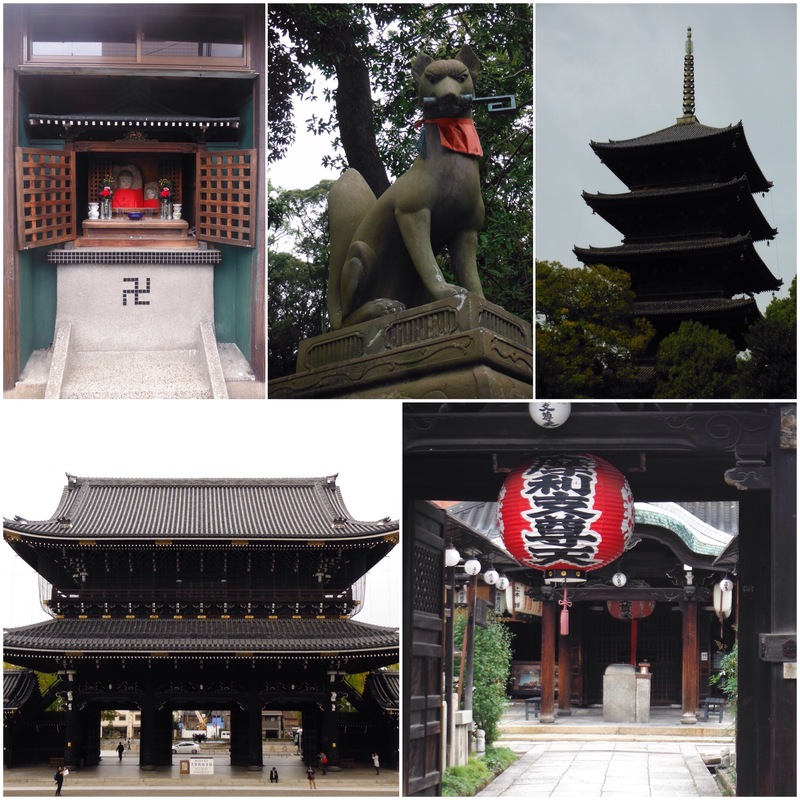 We visited a few of the more popular ones, but they are always so busy, and there is really no need to do any special detours to see shrines and temples in Japan. 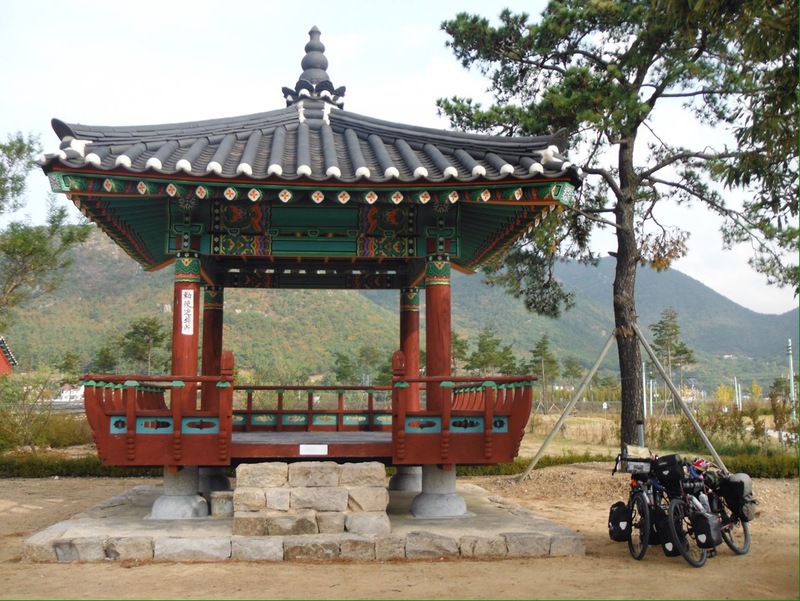 We would ride past so many out on the road, often small ones tucked away up hills or between houses, and these were more enjoyable to visit as they were actually quite peaceful. But when in Rome and all that…. 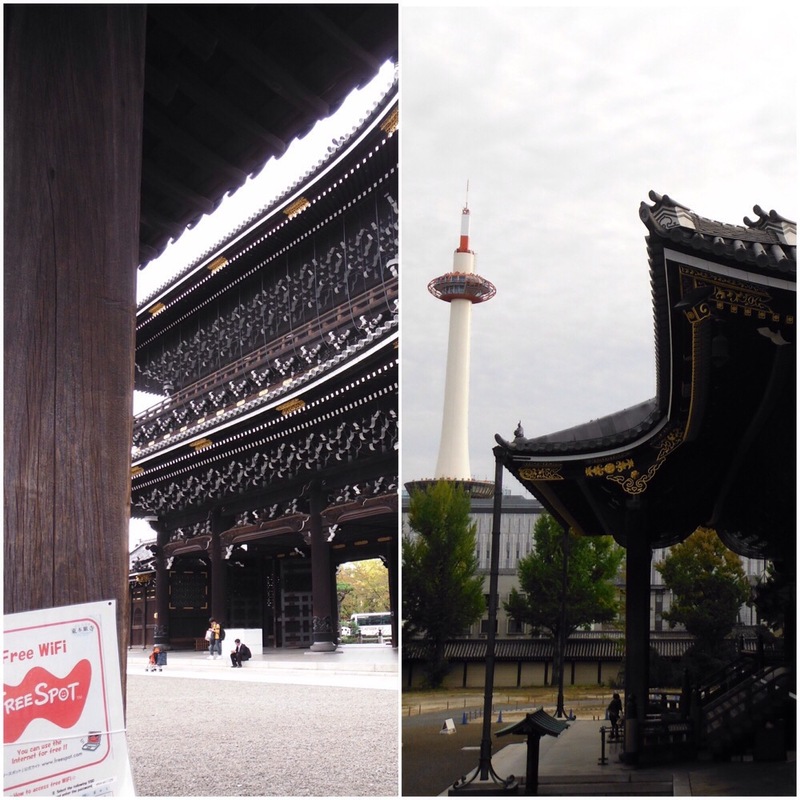 we walked around Higashi-ji (biggest), Kinkaku-ji (gold-est) and To-ji (tall-est) temples, Fushimi shrine (most orange gates) and a few others that we happened to pass by. I think we also went to a red one, it’s hard to keep track. Amongst all of this history, the station building shows the other side of the city – a modern glass structure that entertained us with a huge staircase that lit up with animated pictures. Another reason for visiting Kyoto was to do a talk to a group of Japanese university students. We spoke to a class studying basic level English and had plenty of questions fired at us about cost, best places, food etc. Our two favourite questions were probably “how close have you come to death?” and for the first time on this trip “where are your husbands?” Quite different to the primary school kids. One afternoon in Kyoto I was in the Starbucks queue (getting water, we are still not going to big chain places) and suddenly everyone’s phone had a message alert at the same time. It was like something from a film, they all made the same sound, and everyone took their phone out and looked at it simultaneously. It was one of the most surreal things I havhe ever experienced. About 2 seconds later the ground started moving. It was an earthquake text alert. Probably the second most surreal thing I have ever experienced. For over ten seconds the ground shook – I had a mild panic for a millisecond then realised nobody seemed to care, they all put their phones away and carried on staring at their coffee, and my water bottle was filled during the shaking with the skill of an air hostess during turbulence. This is life in Japan. It was a 6.6 magnitude earthquake in the west of the country, which felt like 3.0 to us in Kyoto over 300kms away. The locals might have taken it in their stride but it was a scary reminder to us foreigners that nature is a powerful beast. 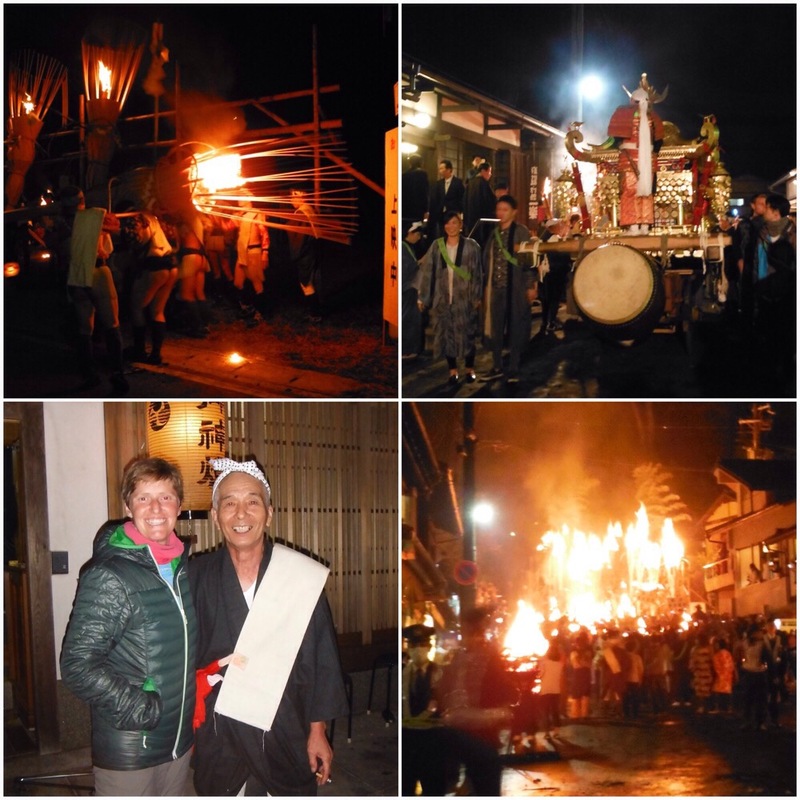 We had heard that Kurama, a small village about 20km north of Kyoto in the mountains, has an annual fire festival on 22nd October, the day we would happen to be leaving Kyoto. 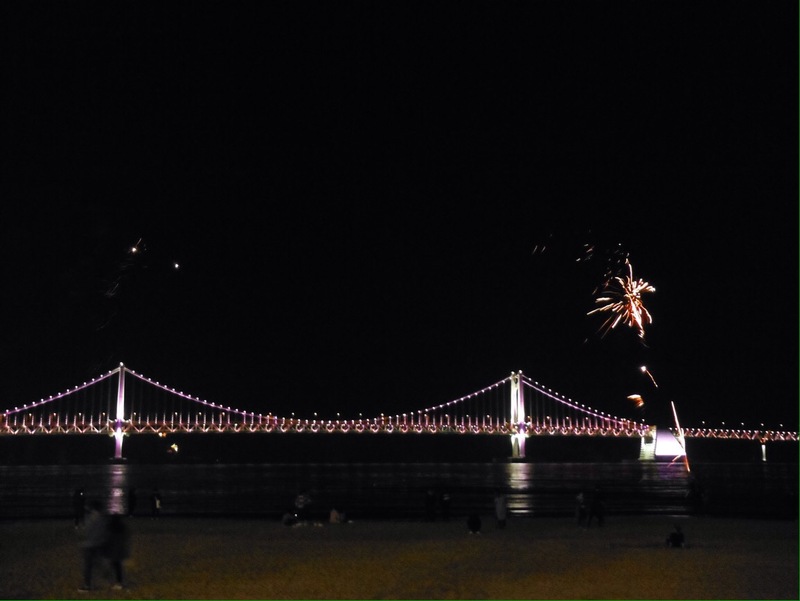 Who doesn’t want to experience a fire festival? That’s also what about 10,000 other people thought. On our way out of the city we were stood outside a supermarket and heard someone shout “Debs and Jo” from a car window. It’s strange that when you first leave home, every time you hear someone shout something that might be your name you turn round only to remind yourself that you are away from home and nobody knows you, of course they are not shouting you. After over a year we are now tuned out to any shouting – who would know us? So it was strange that someone actually did. In the car was a primary school child from the British School in Tokyo who had been in our presentation. We are famous in Japan! Almost. 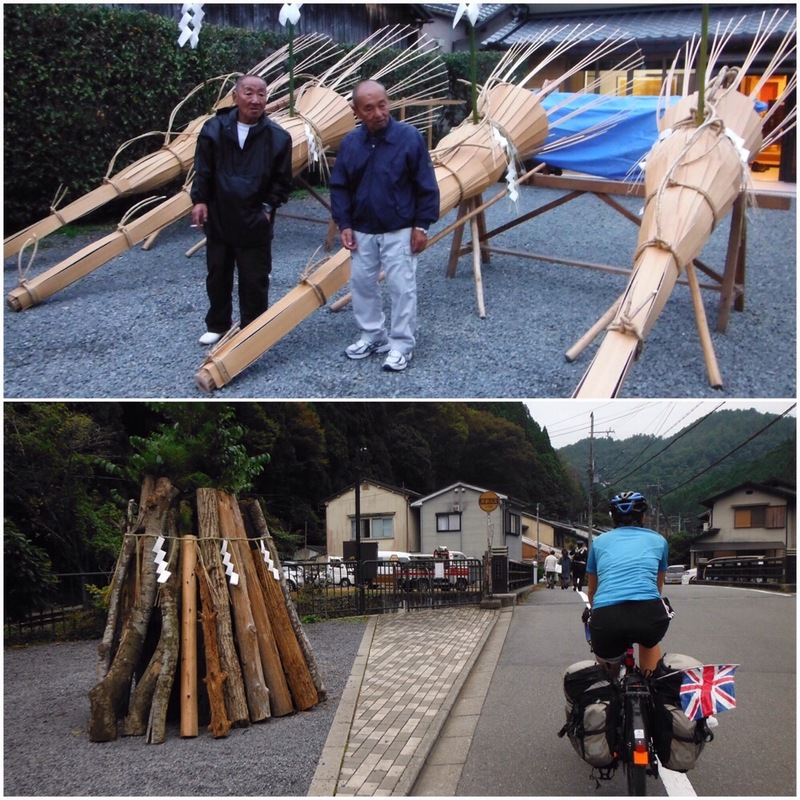 We arrived in Kurama just before 3pm as we wanted to get our loaded bikes in before the roads around the village closed. All of the houses had piles of wood or large torches ready to be set on fire later, and there were young men wandering round in traditional outfits (read: practically nothing). As it got dark the crowd grew and by 6pm things were starting to be set on fire and the place was packed. In a country where health and safety rules are rarely bent – for example, Tokyo has an Eiffel Tower replica which has to be painted orange and white, like all the masts in Japan, to meet health and safety requirements – it seemed a little risky to have so much fire on a narrow street of old wooden houses surrounded by forest, but maybe that’s just me being picky. Every policeman in the Kyoto region was on hand to control the crowds, and so you couldn’t actually stand and watch what was going on but had to walk (very slowly, 10,000 people remember) around a cordoned off loop. About 30% of this was in front of the interesting stuff, the rest was around the back of the village where you couldn’t see anything. It was all quite odd and very busy, and we didn’t see much until about 9pm when most people got back on the train to Kyoto. Then it got interesting as we could see the chanting, the marching, the carrying of fire torches and other crazy things. It was quite an incredible thing to witness. 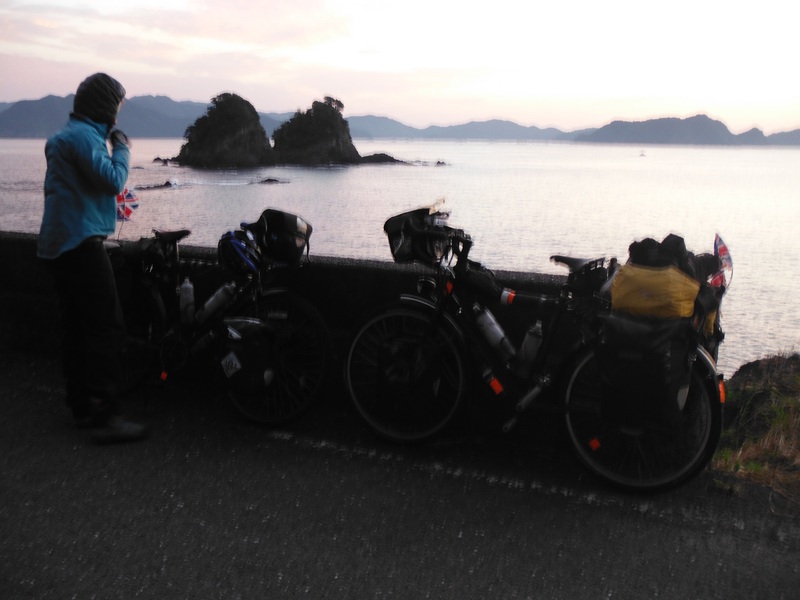 About 10.30pm we managed to get back to our bikes and started to think about where we would camp. First choice was north of the village in the forest, but we had seen bear signs and the odd English-speaking local said “bear!” as soon as we mentioned we were sleeping in a tent. Not being a fan of camping with bears we were just wondering what to do when a traditionally-dressed local saw our bikes and shouted “beer” (much better than bear) so we spent the next hour sitting drinking beer and having a strange conversation with two guys in strange outfits in mime and bits of English. As soon as a young person passed by they would be grabbed, shoved in front of us and instructed to translate for a while, and only released from their embarrassment when the next potential translator arrived. When we said we were from Leicester we received the reply of “champions!” (while pointing at his foot) and “Shinji Okazaki” – it’s not just in Italy where our city can now be identified by football fans. Another guy, who turned out to be a chef, brought out a plate of sushi which was amazing as we had mistakenly assumed that there would be food available at the festival (maybe that would be a health and safety problem) and had only eaten a jam sandwich since lunch. There was just about time to witness some more chanting and fire carrying and then at 1am we finally escaped and found a patch of grass under the train line for our tent (hopefully away from the bears, but we hung our food anyway) wondering why we were bothering for four hours sleep. But the evening as a whole was well worth the lack of sleep that followed. 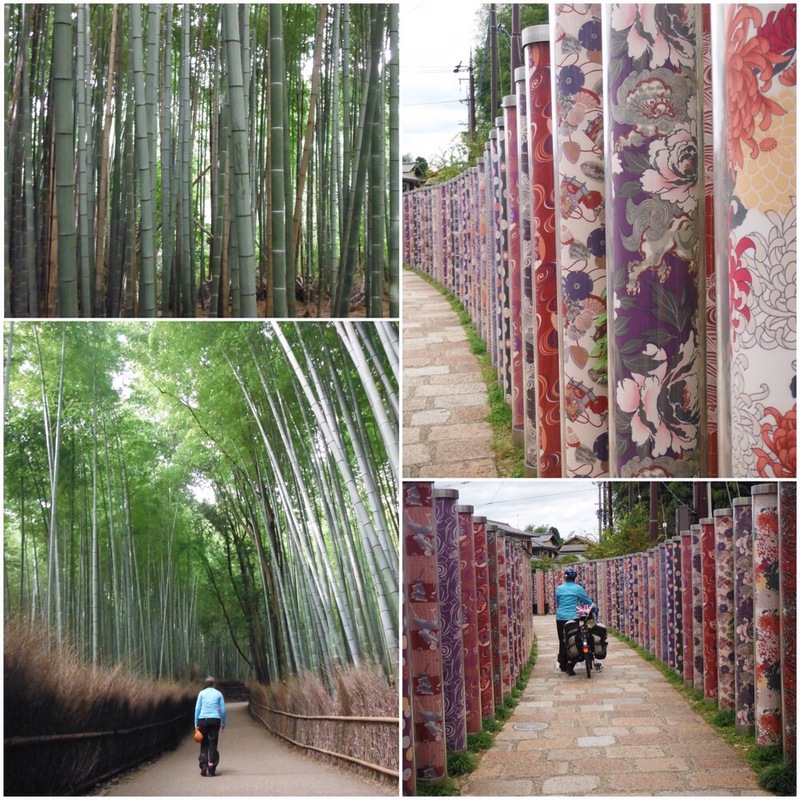 After a 5am start we rode with our eyes barely open back through Kyoto via the famous bamboo forest and the less famous kimono forest. Being up early we beat the crowds for once and enjoyed some peace and quiet. 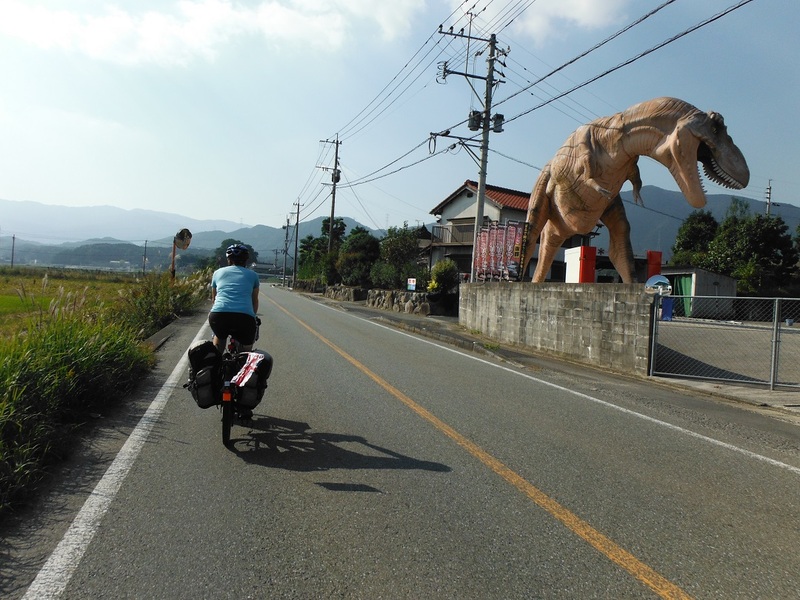 An uneventful 50km ride through busy suburbia (there is no separation between towns at all in this part of the country – one just blends into the other in an endless stream of supermarkets, car garages, convenience stores etc) took us to Mike and Tomoko’s house. Mike had cycle toured lots himself and as soon as we arrived said the magic words – “you probably want some snacks” – and that’s it, we were settled in for a few days. 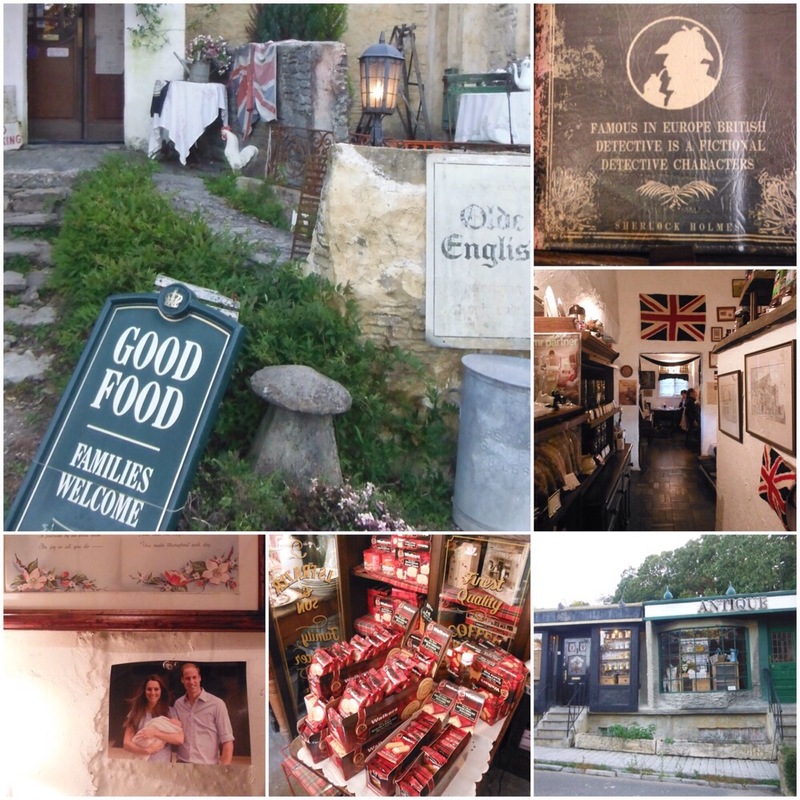 Mike and Tomoko drove us out to Dreamton, an English style theme village where the eccentric owner has built English-looking buildings and covered the place with English trinkets, including pub signs, other antiques, and a wedding dress shop. Naturally. It was all very bemusing and a lot of fun. We had afternoon tea in the Pont Oak cafe where the toilet has a picture of Wills and Kate on the wall, cut out to look like it is a photo that was maybe taken of them while they were visiting. It was fun to eat scones and lemon cake and drink Earl Grey, although Bezza would be disappointed that it wasn’t a lemon drizzle. That evening we had our first conveyor-belt sushi experience, which was all the better for being with people who could explain what is was that we were eating. Chatting to Mike and Tomoko helped us finalise plans for our last week or so in Japan. 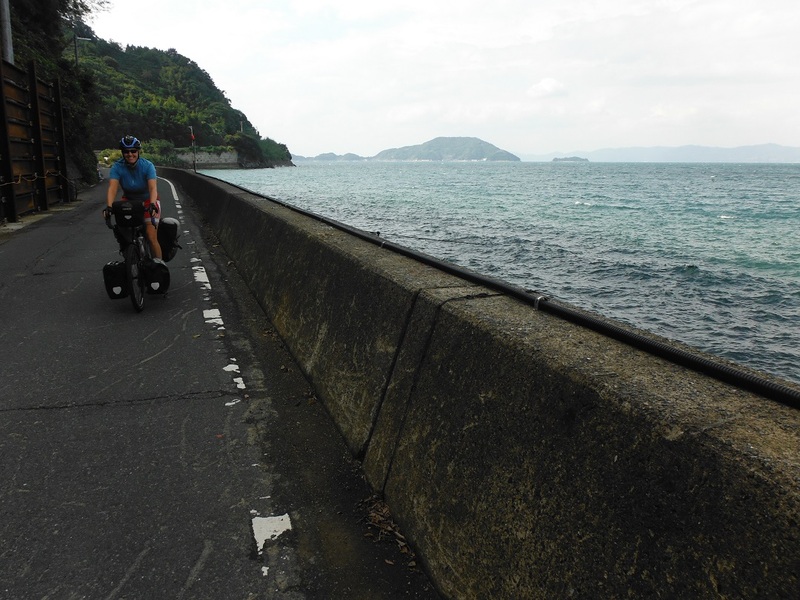 We were tired of busy, heavily trafficked roads surrounded by buildings, and set out to find some quiet scenic roads on the island of Shikoku. Thanks to Kevin, Rob, Kurama’s Shinji Okazaki fans, and Mike and Tomoko. -Our first earth tremor in Japan. Let’s not say Earthquake because that’s a bit scary. 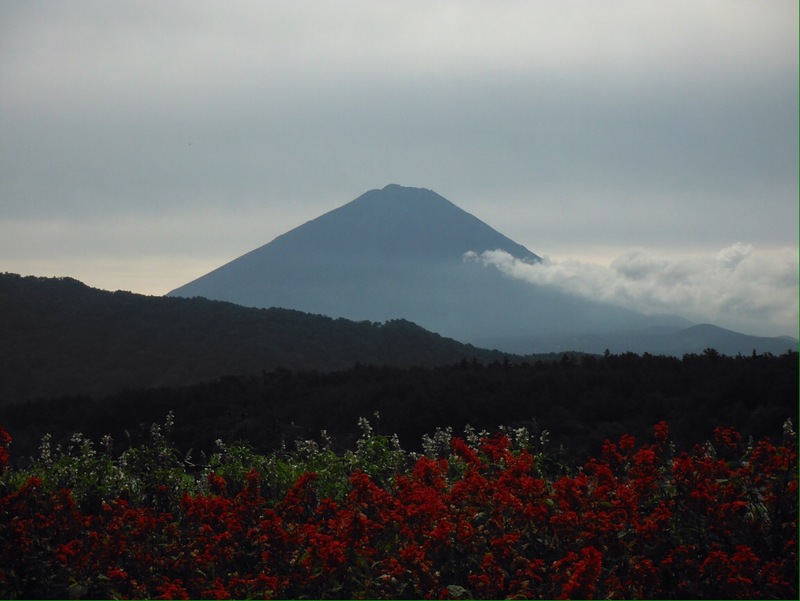 -I saw Mt Fuji then clouds hid it. Jo wasn’t sure whether to believe me or not. -A fab food surprise. Bought a fridge bakery item that looked like chocolate flavour sweet bread with a very generous cream filling. Felt pretty weighty. Turned out it had a whole banana inside. That’s the stuff cyclists’ dreams are made of. -Pensioners’ baseball training. Lots of old men arriving at riverside ball parks with full kit and bats in their bike baskets. -Walking group Wednesday. 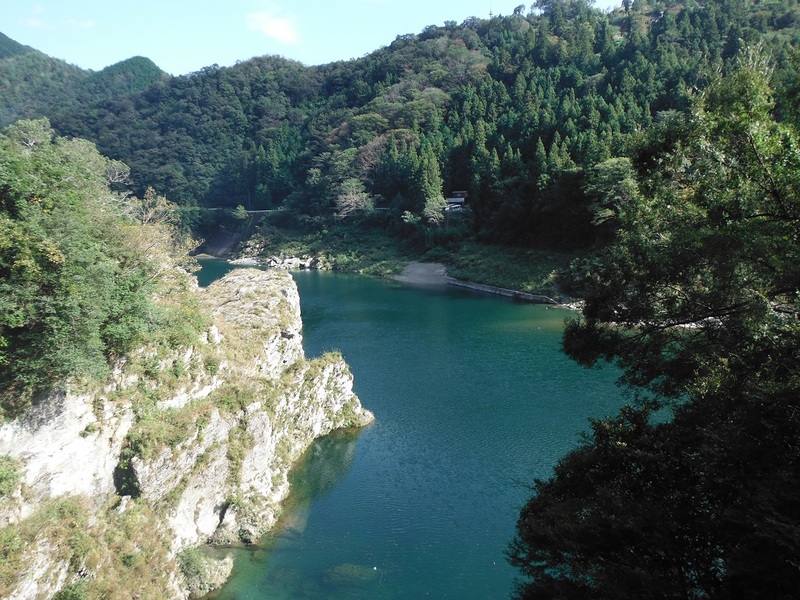 If you don’t play baseball in the Tama river area, you join a walking group. 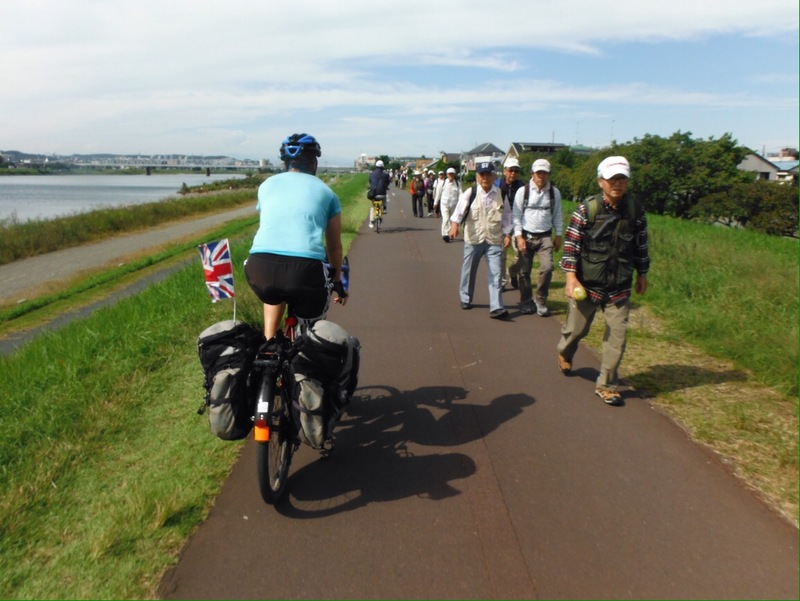 Hundreds of hikers bemused by the British bikers. -A friendly cyclist stopping us and asking us to wait a moment. He ran off the cycle path and came back with bottles of cold water for us. It was a hot morning and a really lovely gesture. 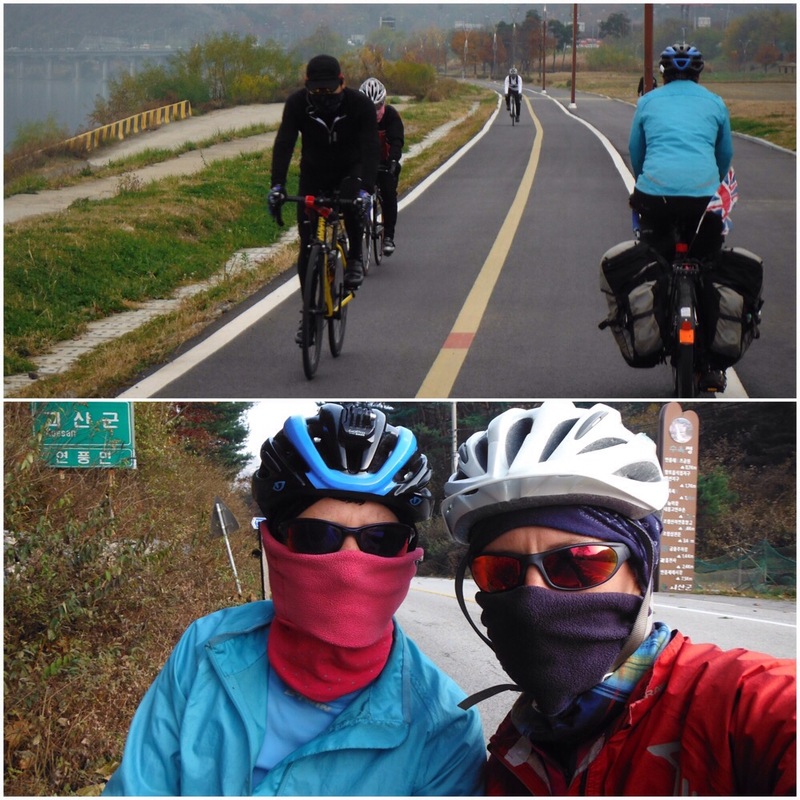 -A road cyclist passed us wearing a balaclava type garment with no eye or mouth holes. It was black. Creepy. 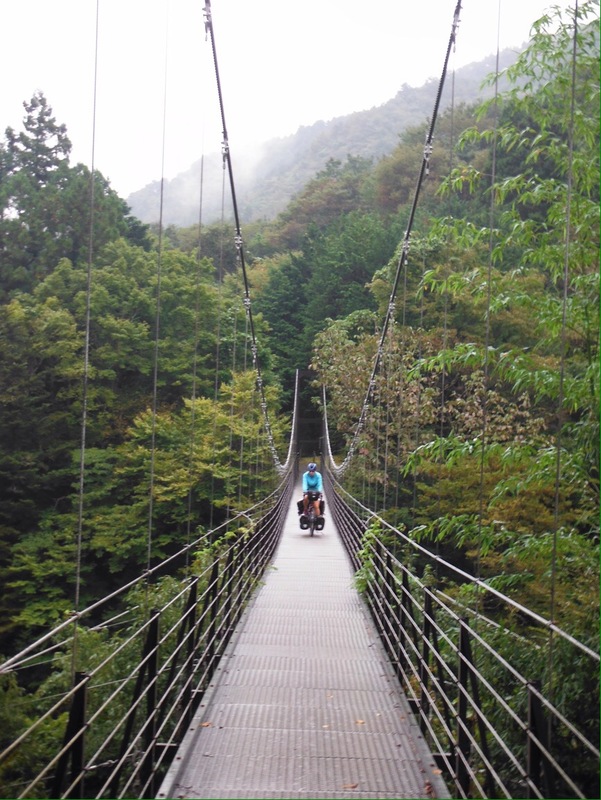 We left the river and rode uphill in a narrow valley, getting occasional glimpses of Mt Fuji as clouds moved. There was hardly any traffic and a noticeable drop in temperature as we got higher. We found an actual campground and had a long unproductive discussion in Japanese/English with the owner. After some time we worked out that he was telling us about a big power cut in Tokyo. 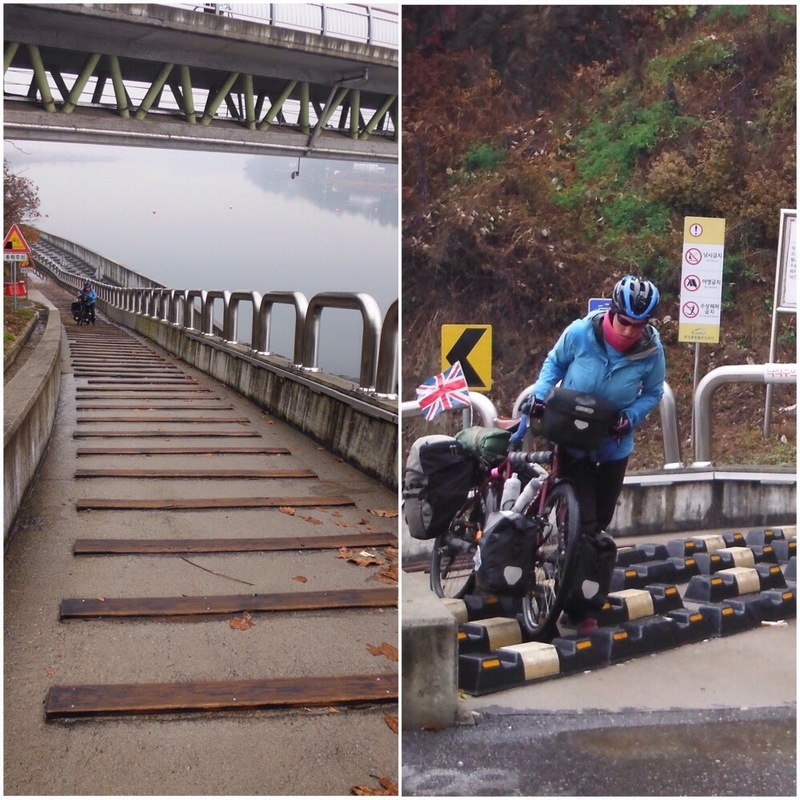 We followed a little footpath and found this awesome swing bridge. Early to bed, early to ride up hill. Apparently we were ascending a 1000m pass. There wasn’t much around in the way of food. Eventually we found an open shop and got bread for jam sandwiches. Then it got even colder and started raining. In the clouds we couldn’t we see far in front of us let alone see Fuji. 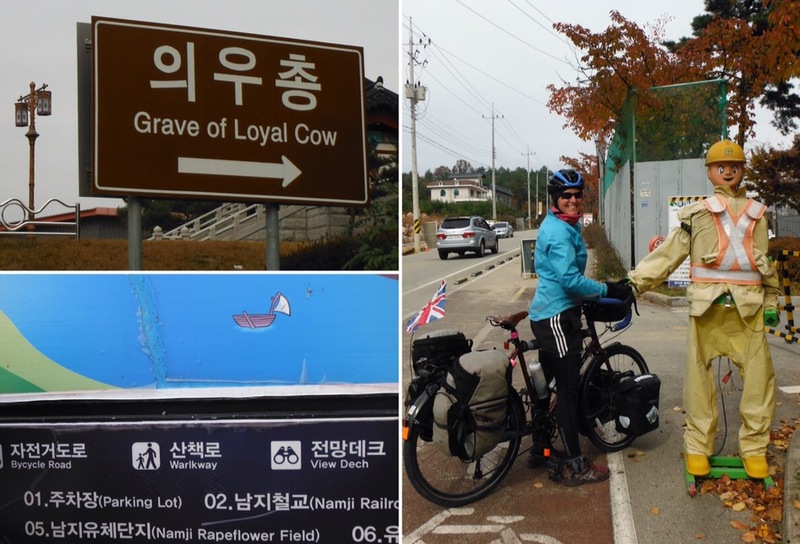 It wasn’t a great deal of fun, and with a better weather forecast the next day we stopped riding early and enjoyed being indoors and having a Japanese bath at a youth hostel. It was a lot of fun eating at a tiny table in our room and arranging our bedding for comfy seating. Gourmet noodle and lots of snuggly blankets. 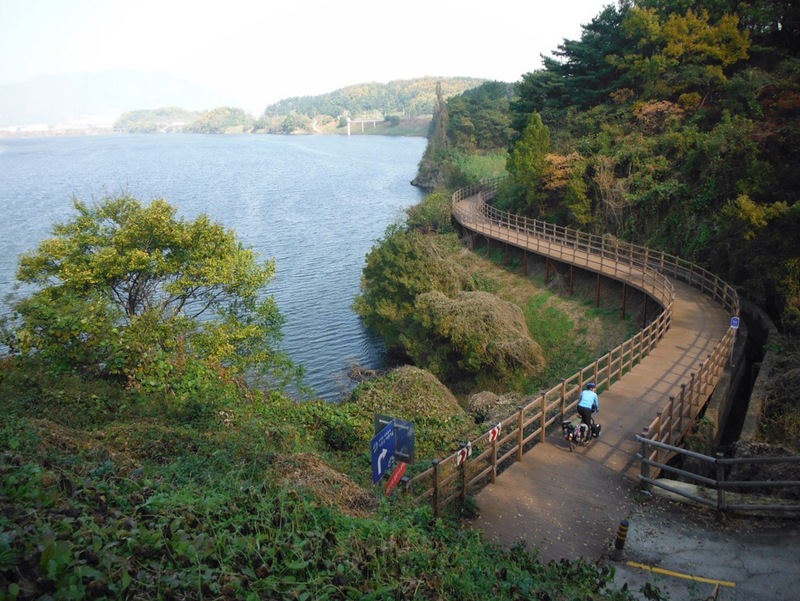 Cycling around Fuji’s five lakes the next day was much more enjoyable. 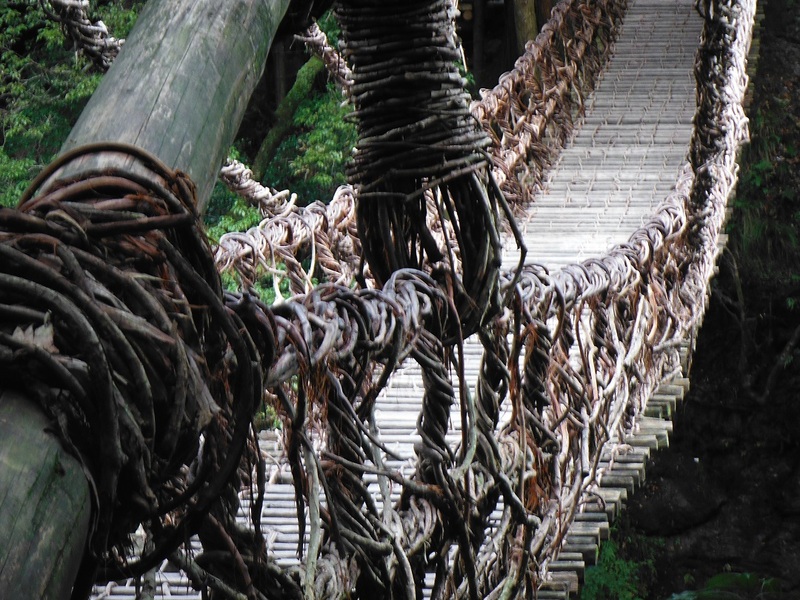 At times there were clear views of the volcano and an amazing descent into a river valley. I was on the lookout for Shinkansen, but we were just by the normal train lines. We camped in an empty plot in a village and felt lucky to have found it. Nearly all the flat empty land here is used for growing rice and veg. 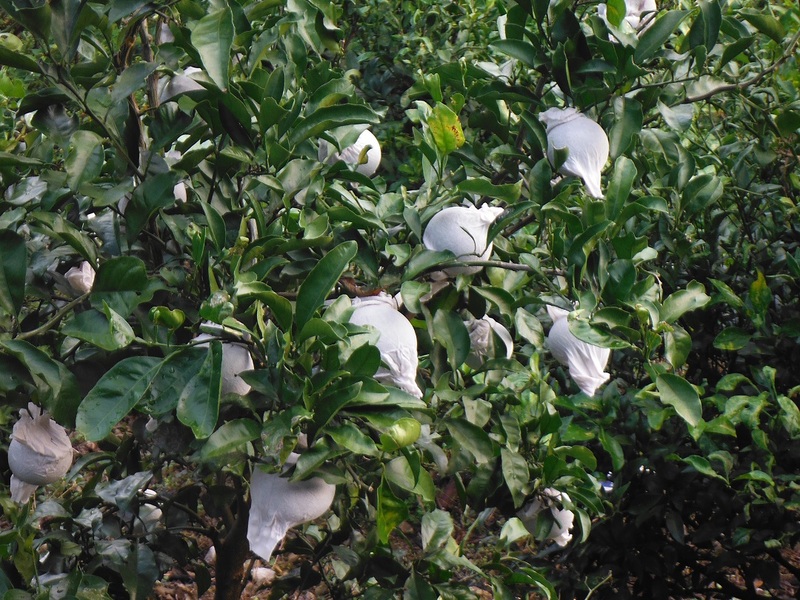 Even really small patches have rows of leafy greens or a few fruit trees. We had asked permission from the next door house, and the friendly family later brought us out two homemade onigiri and a beer each. 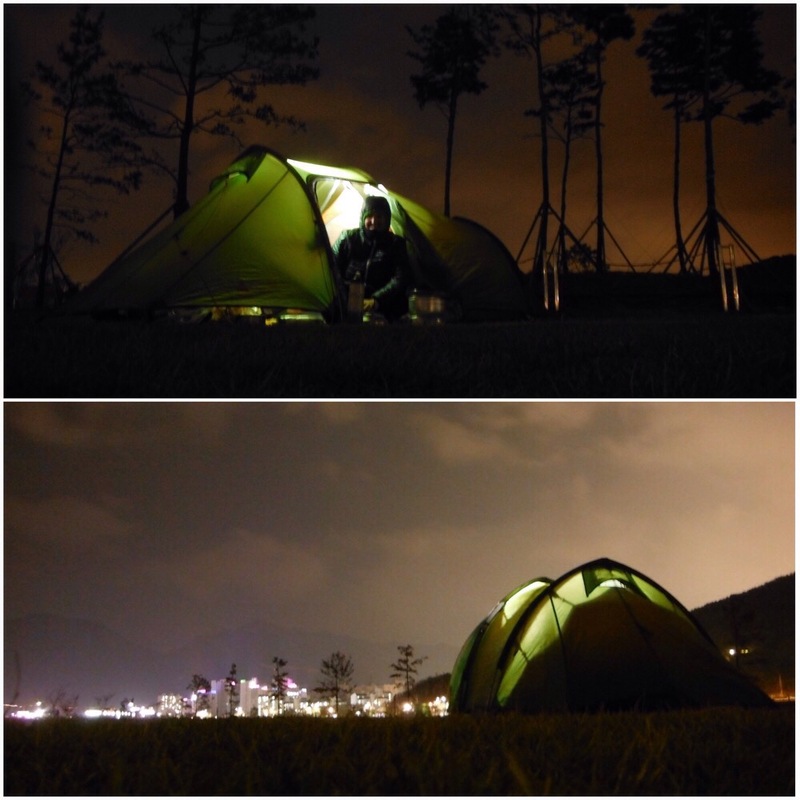 Mt Fuji and a beer in the tent – Happy Friday night! 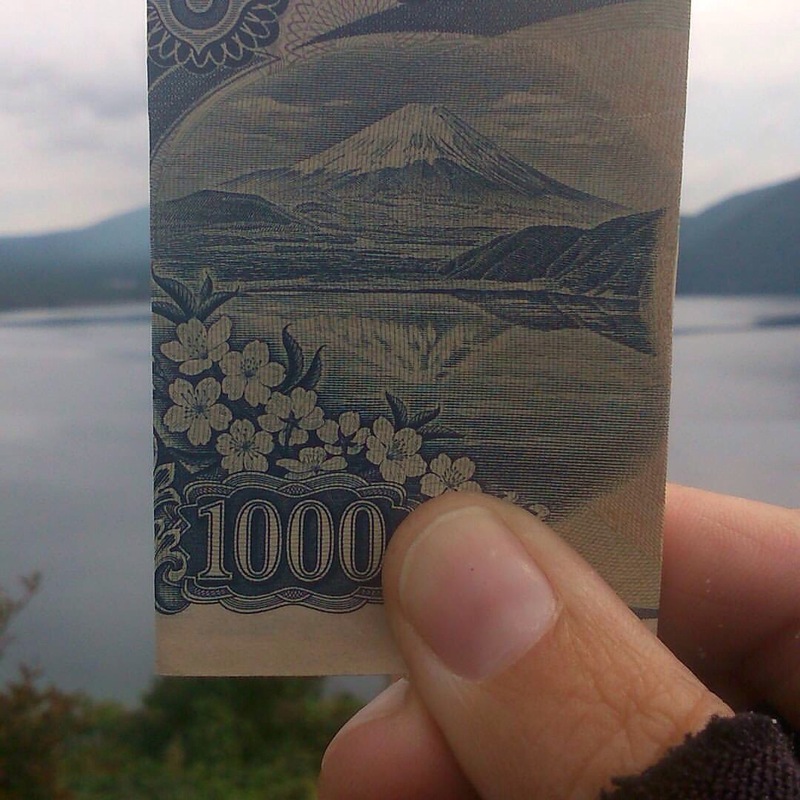 Fuji-san. Always cool to see things in real life you’ve seen loads of pictures of. 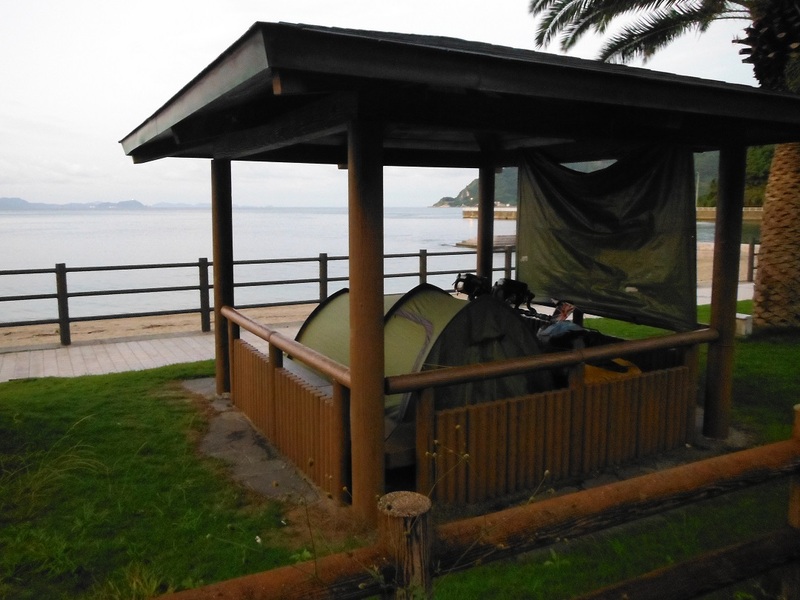 The next morning we were drying the tent outside a Michi-no-Eki (like a service station, but with local veg, nice normal price food and no petrol) when a young man came over to chat. 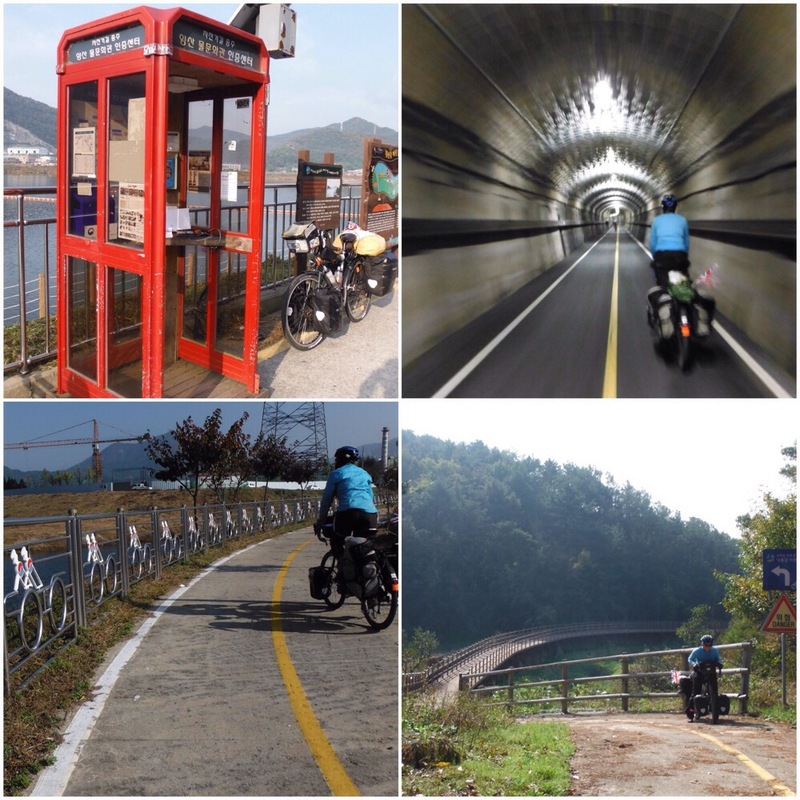 First he handed me a plastic bag from the nearby supermarket as he thought we had a long way to ride. It had 2 onigiri and 4 bananas in. 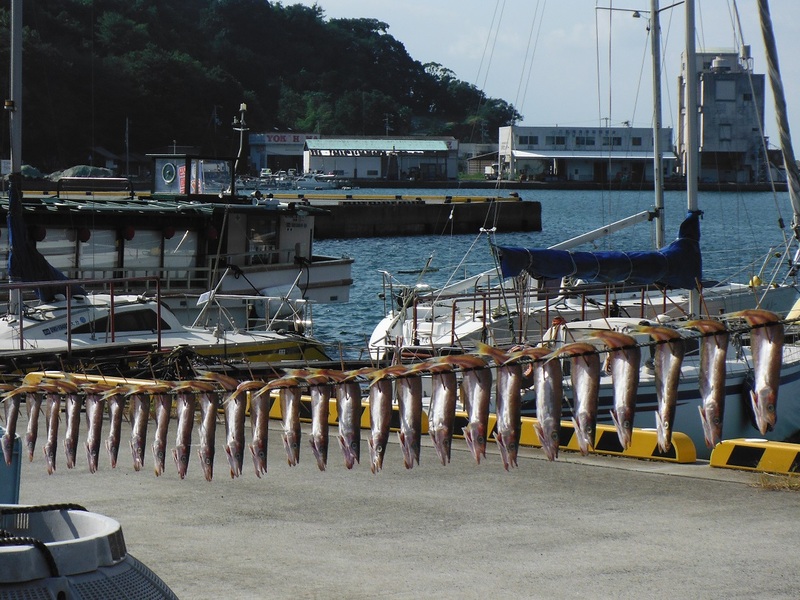 He asked about the trip, and then asked if I thought Japanese people were friendly. He was really surprised when I said yes, and tried to tell me that they weren’t, having just given a total stranger a bag of food. It was like some of the comments we heard in the USA about the world/strangers being scary – from people who had just invited two (slightly grubby) strangers into their homes for the evening. Everyone should remember that the world is mainly full of kind people. 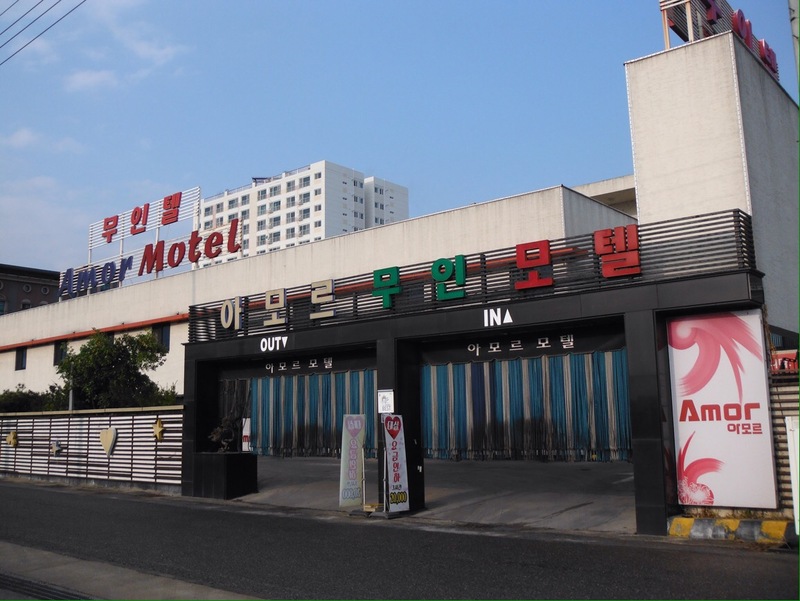 -As we approached the campground we could see many coloured lights and lots of cars. It was a special illuminations display. For Christmas. It was busy and strange. There was twinkly music and tannoy announcements. -We went for our first onsen (hot springs). Jo bought the tickets from a vending machine right next to a desk with a real person behind it. We then gave the tickets to the person, who told us something in Japanese. It was probably about shoes. -Saturday night at the onsen is busy. You go into separate men’s and women’s ones and get naked. Then you have a really good wash at a little seat with a shower next to it. Only then do you go in the hot springs. Our tan lines looked weird. -Most people put their pyjamas on after to drive home. We just walked back to our tent. 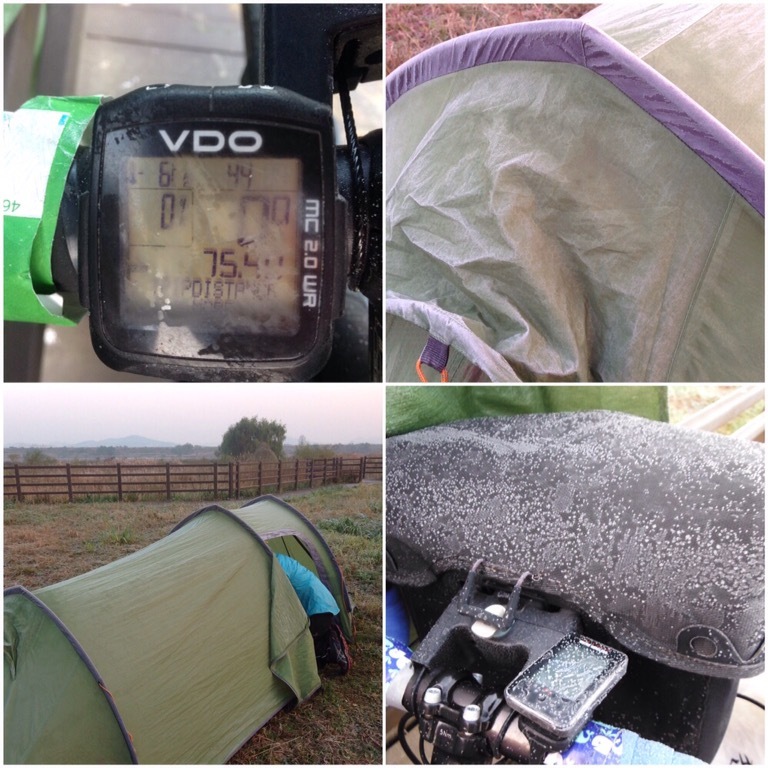 It was lovely to get in sleeping bags fully warm and relaxed. At 8:30pm. -The illuminations tannoy also had a speaker near our tent. At 9:45pm there was an announcement and Auld Lang Syne started playing in the style of a lullaby. Apparently this is the Japanese equivalent of the last orders bell. It played on repeat until the illuminations closed at 10pm. That’s a lot of Auld Lang Syne. Each time it got to the end of the loop we hoped it would stop – those fifteen minutes seemed very long. 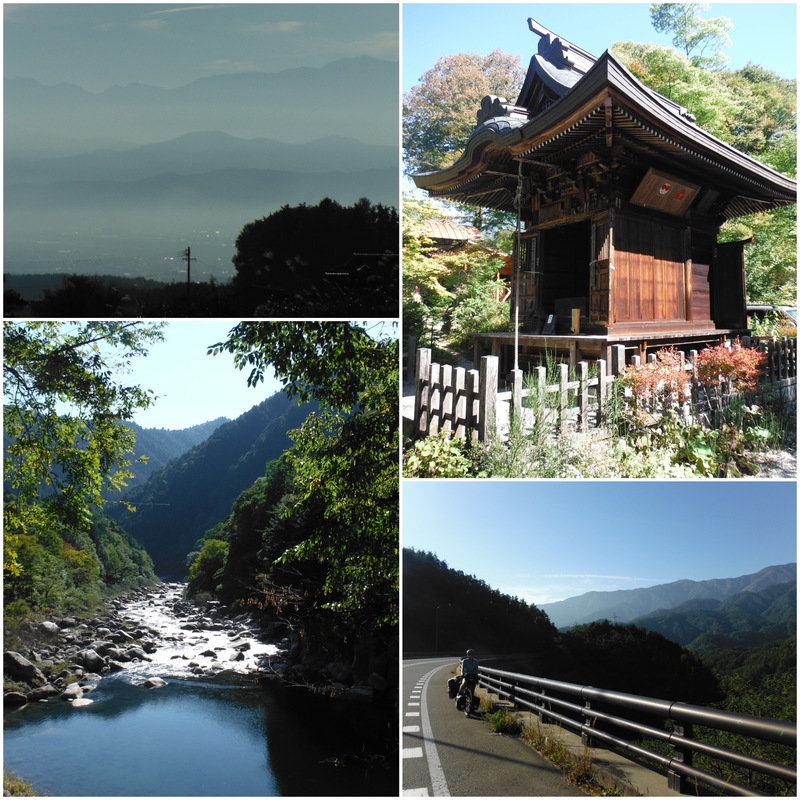 Sunday Funday on the road South West from Nagano. We crossed a pass via a slightly smoggy 4.7km tunnel from our valley to another one with cool river cliffs and quieter roads. On a sunny Sunday afternoon it was the best cycling so far, but we quickly got into a busier area. 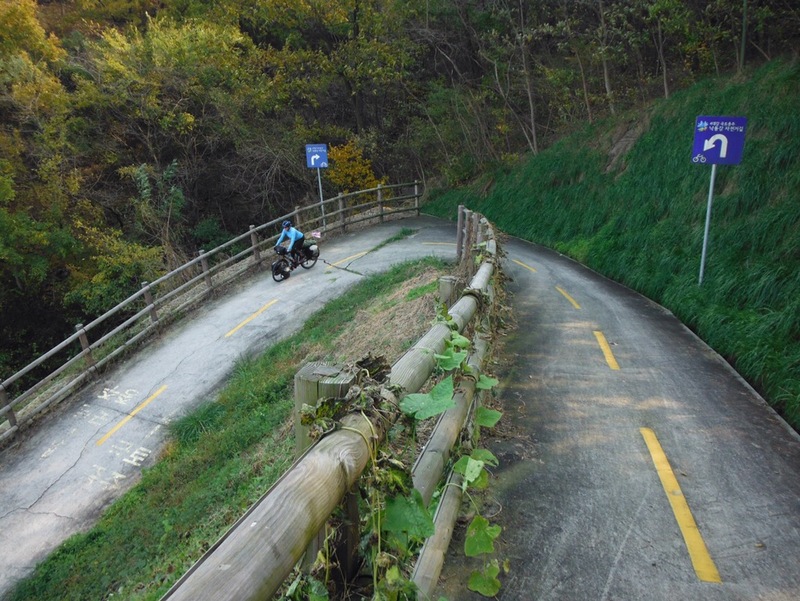 Cycling in Japan seems to be either 1. Flat (ish) and along trafficky roads in highly populated areas or 2. Ridiculously hilly. The next day was almost all on a busy road with loads of traffic. To make life more interesting it had started raining heavily at about 2:30am. The tent got soaked, and then so did we packing it up. The trickle of a waterfall we had camped near was now a raging river. The rain bounced off the roads, we were being sprayed by trucks and water ran down inside our clothes. 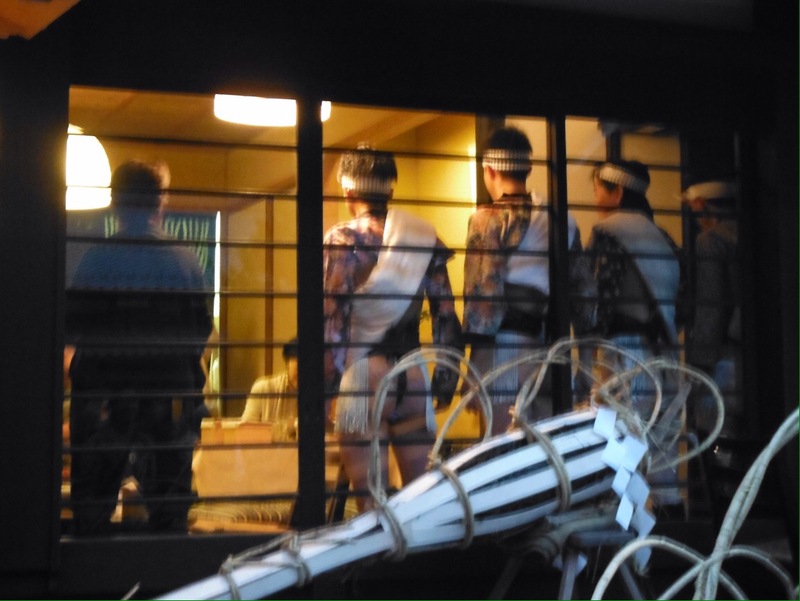 It was the anti-onsen. Slightly scraping the barrel for interesting stuff for that day, but we did enjoy a Japanese breakfast at a restaurant where you press a button to place your order. The staff didn’t even mind that we made a lake around our table. Hikone Castle. 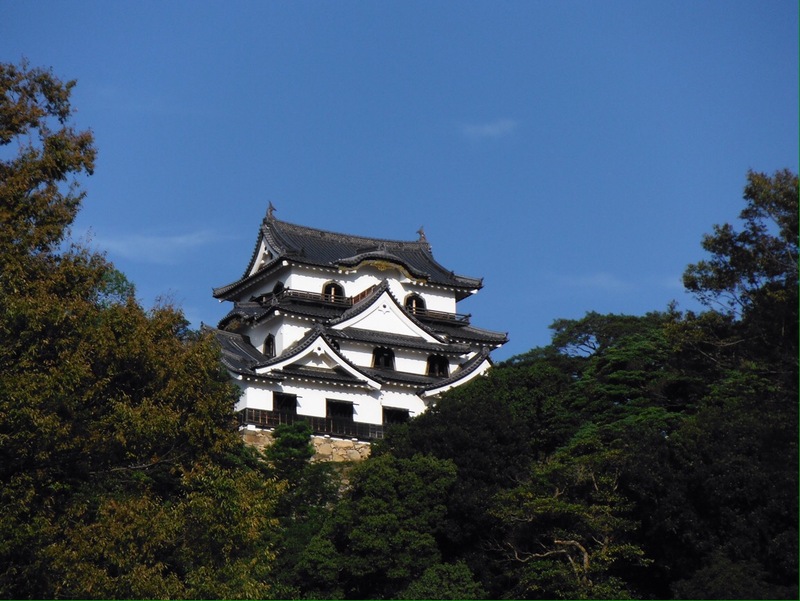 Castles are Jō in Japanese, which Jo liked a lot. The next couple of days took us to a castle, a lake and excitingly past real bamboo groves. Even better, we finally saw several Shinkansen. They look like Concorde and really are fast. Sadly they are not for bikes, unless you put your bike into a (regulation sized) bag. 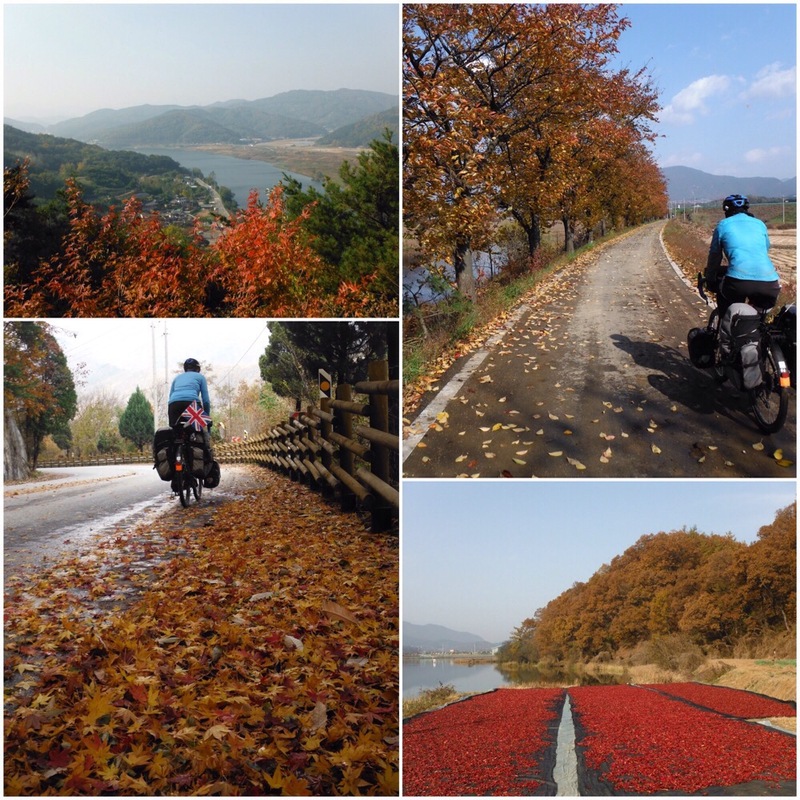 We pedalled all the way to Kyoto instead. There was time for one more little adventure. 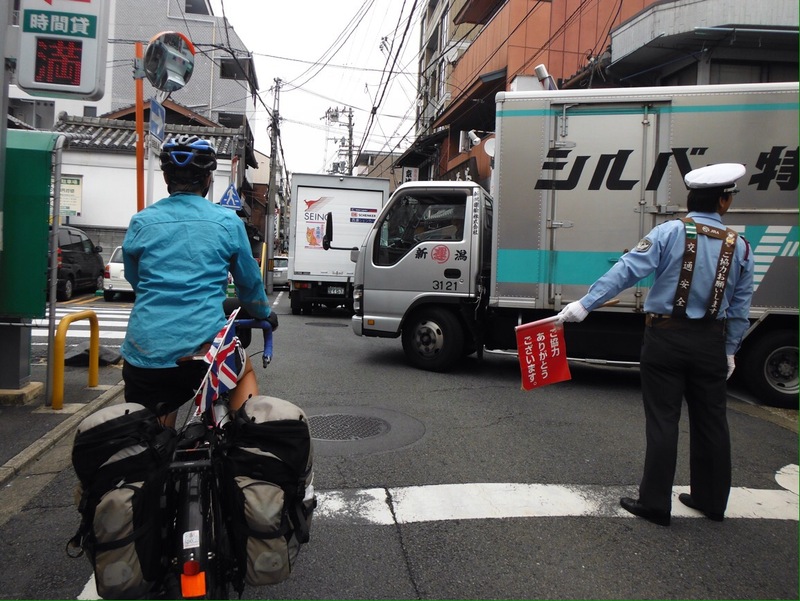 A police car pulled up in front of us with lights flashing and a Japanese loudspeaker message. Maybe they had seen us not waiting for the green man at crossings? Or perhaps we were flaunting some other road law? We definitely hadn’t eaten any bananas in parks that morning. A smiley policeman got out and asked (I think) for our Gaijin Cards (foreign residents ID). I offered passports, which he took and spent a long time copying the names and dates from. 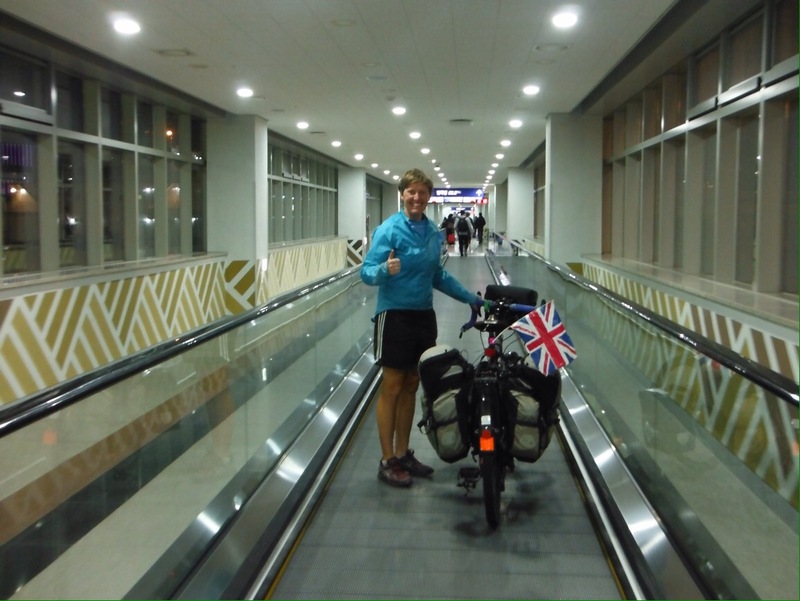 It was a relatively smooth process, after we established that Jo was Joanna Welford and not Joanna Britishcitizen. We also had fun numbering the months – not sure why UK passports do not have this information. At no point was our Japan entry sticker checked, or our passport numbers noted, but we all had a lovely time thanking each other and went our separate ways. Thanks to: Nina & her Mum & Dad, the kind man with the tinyhouse, Gilles, Jacqueline & Robert.